Colorado Springs, Colorado. September 4, 2014 – The public is invited to visit the Space Foundation Discovery Center in Colorado Springs on Saturday, September 6, for a special day of “Exploring Mars,” part of its monthly “Star Days” series. Participants will be able to drive a rover on simulated Martian terrain, play Minecraft Mission To Mars in the AGI Space Missions Simulation Laboratory and watch a special Science On a Sphere® presentation, “The Air of Mars: Exploring Mars’ Atmospheres with MAVEN.” These activities are included in the price of Discovery Center admission on September 6. 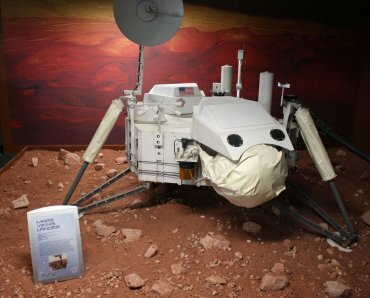 The Discovery Center also displays a Mars Viking Lander exhibit with details of the 1975 Viking Mission to Mars. The “Exploring Mars” program will be the perfect introduction to the Red Planet and a great kickoff event for this month’s MAVEN activities happening throughout the state. The MAVEN spacecraft enters its Mars orbit on September 21. “Star Days” are held one Saturday each month at the Discovery Center, 10:00 a.m. – 5:00 p.m., with a new space theme each month. Activities are appropriate for all ages, and admission savings are available through the Discovery Center Passport program. Learn more at www.spacefoundation.org/museum.